YORKSHIRE’S Jenny Duncalf is hoping familiar surroundings can help inspire her to a third British Nationals title in Manchester. The 33-year-old former world No 2 won the event previously in 2007 and 2009, and has twice been a runner-up. After six months being based in Brisbane and a disappointing start to 2016 has seen her exit at the first round stage in three Tour events, Duncalf is feeling refreshed after spending time back home in Harrogate. She has spent some of that time receiving physio for an injury which didn’t help her cause during the three-and-a-half weeks she recently spent competing in North America. Duncalf, ranked fourth for the event, begins her bid for a third title against fellow Englishwoman Leonie Holt, ranked 113th in the world. If, as anticipated, Duncalf progresses, she is likely to come up against Halifax’s Sarah Campion – formerly Sarah Kippax – who defeated her at the British Open two years ago in Hull. Getting over that hurdle will probably see a more familiar face in the shape of Alison Waters will waiting for Duncalf in Saturday’s semi-final. Duncalf admits her initial aim is to reach the last four and, from there, anything can happen. “I want to make my ranking at least,” said Duncalf. “I haven’t seen Leonie play for a long time but, as is always the case in these situations, I’m not taking anything or anyone for granted. “Playing at the Nationals is like playing at home. It’s nice and relaxing and it’s good for my family to come and watch. “And I like the idea that you can chuck a few things together in the back of the car and drive over there and get ready to play – we don’t have to wait around at airports all the time and stuff like that. “Over the years I’ve spent a lot of time playing and training at Manchester. Elsewhere today, eighth-seeded Campion comes up against qualifier Rachel Chadwick in the first round, while second seed Waters begins her bid for a fifth Nationals title against Wales’s Deon Saffery. In the top half of the women’s draw, top seed and two-time winner Laura Massaro kicks off against qualifier Georgina Kennedy, while 2015 champion Sarah-Jane Perry – ranked third this year – begins her title defence against Hull’s Finoa Moverley. 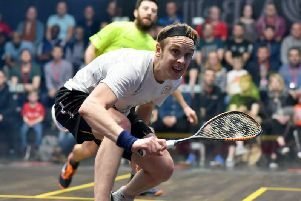 In the men’s draw, Harrogate’s James Willstrop, the No 2 seed and a winner in 2007 and 2008, meets qualifier Adam Murrills, seven-time champion Nick Matthew faces Chris Ryder. Harrogate-based Chris Simpson is seeded four and starts his bid for the title against Ben Coleman.